tell me that isn't funny. You have no idea who I am. Chances are, you just stumbled upon my blog, and read the first few entries on the front page. However, with one comment, I immediately have learned exactly who YOU are. You are a cynical, bitter, bored man who does not bother to read enough, or care enough, to actually free him of his cynicism, bitterness, and boredom. 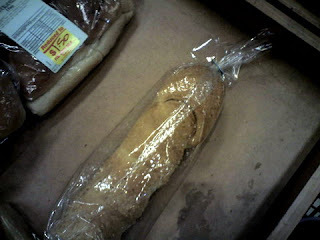 Btw..the bread..oh so terribly funny...why hadn't anyone bought it yet! I read your comment last time and shook my head but this one has really given me the willies. What is your problem? Seriously? You clearly think you are above the rest of us. If the contents of Markoos' blog bother you so much then don't bother reading it. No one is forcing you to. I for one cannot see how this hurts anyone. I personally think it is great to see a creative person such as Mark putting a slant on everyday things. Life is hectic and crazy and it is great to have a break from it occasionally. Get off your highground, if anyone is cynical, bored or bitter it is you mate.